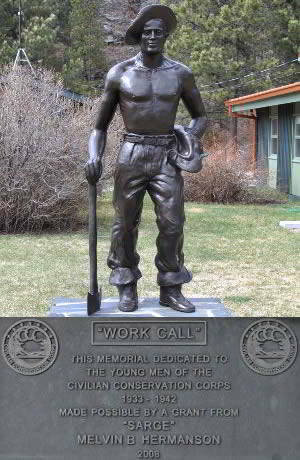 South Dakota Civilian Conservation Corps (CCC) camp Camp Summit Peak was 24 mi NE of Newcastle, WY. Summit Ridge Cabin is located on the western border of South Dakota in Black Hills National Forest, providing a perfect setting for guests seeking recreation and relaxation. 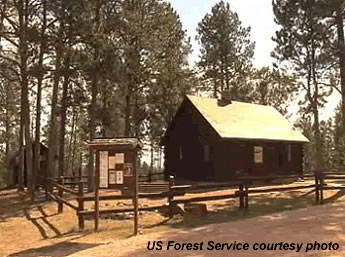 Built by the Civilian Conservation Corps in the 1930's, the cabin was originally used as an outpost to fight forest fires. Today the cabin is available for reservation throughout the year, though at an elevation of 6,096 feet, it can receive considerable snow in the winter. As roads to the cabin are not plowed, it is generally closed from December through mid-March.